The agent of Ajax star Hakim Ziyech has been quoted as talking up the prospect of his client making a transfer to a big Premier League club, listing Liverpool or Arsenal as his preferences. Speaking in an interview, Ziyech’s representative Rene van der Gijp said he admitted he hoped he could get the in-form attacking midfielder a better move than Roma, though he was even more scathing when asked about the prospect of a move to Everton. ‘I hope that there will be a better club than Roma – an Arsenal or Liverpool,’ he told Voetbal Primeur. 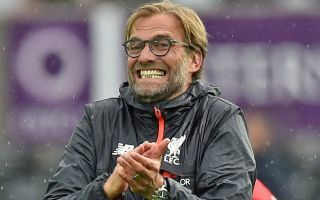 Given Liverpool’s long-standing and bitter rivalry with Merseyside neighbours Everton, Ziyech’s agent’s quotes here suggest he could be an absolutely dream signing for the Reds. The 25-year-old is considered one of the top talents in the Eredivisie right now, having contributed four goals and three assists from midfield in eight league games this season. Liverpool aren’t exactly short of attacking midfield options right now, though as noted by MSN News, they were linked with Nabil Fekir in the summer so could perhaps be open to adding more depth in that area of the pitch.